I love a good parenting book. Don't get me wrong, that doesn't mean that I'm a 'by the book' kind of parent, but I always find it beneficial to read through and get tips from other parents who have been there and done that. I take these tips, learn from them and adjust to fit my family and my kids- after all, what works for one doesn't work for another. The problem is, as a busy mom, I don't have nearly as much time to read as I would like to. I want to take in these tips and tricks... but who has the time!? Bring Out the Best in Your Kids--and Yourself! In this collection of under-the-radar parenting strategies, you will find a dozen ideas you can use this week. Think of them as "parenting hacks." Be warned, though. Jay's tips come fast and furious. You'll laugh at one page and get real serious a few pages later. Now is the time to connect and celebrate your family, make memories, and bring out the very best in each other. Isn't that what you want? As a family advocate, life pundit, and humorist, Jay Payleitner has sold some half-million books, including the bestselling 52 Things Kids Need from a Dad. He speaks nationwide on parenting, marriage, creativity, and finding your life purpose. Jay and his wife live in the Chicago area where they raised five great kids, loved on ten foster babies, and are cherishing grandparenthood. You can track him down at jaypayleitner.com. Honestly, parenting is tough and we truly all do need a little inspiration and encouragement now and again. Sometimes it takes someone from the outside to help us see where perhaps we could do better! This book was great for that. Each tip has just 1-2 pages making them super quick and easy to read through as we are able. Some of these tips are probably things that many of us do without a second thought, but it's nice to see them written out. Others are things that are so simple and yet not something I might have thought of myself. All are practical, and many also implemented biblical principals. Truly a great book for Christian parents! Again, you don't have to use every tip listed, but there are sure to be some that will help you out too! 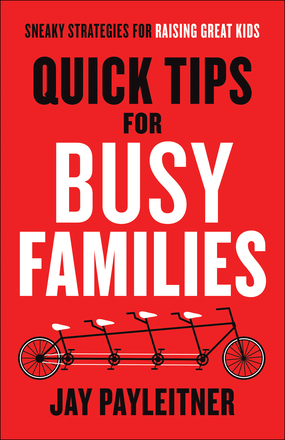 Quick Tips For Busy Families is available to purchase now. So tough!! Especially when they don't listen!! Some days I feel like all I do is yell because he doesn't listen otherwise lol!! I think I need to read this! This book sounds really interesting! I think both my family and I would like this book. Quick tips are always helpful! Thank you!